Floor insulation is often a measure that is missed by home owners and tenants. Not all floors will be suitable for floor insulation. Suitability is dependent upon existing depth of space under the floor and access. 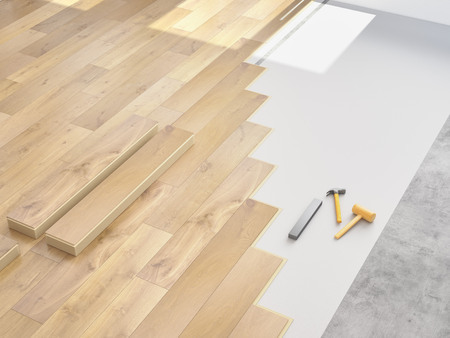 Older homes are more likely to have suspended timber floors. Timber floors can be insulated by lifting the floorboards and laying mineral wool insulation supported by netting between the joists. Many homes, especially newer ones, will have a ground floor made of solid concrete. This can be insulated when it needs to be replaced, or can have rigid insulation laid on top. *Costs may vary significantly depending on level of work required. Figures are based on fuel prices as of March 2016. If you are adding extra insulation to your floors, the work will need to comply with the relevant building regulations for where you live. Your installer will normally arrange this for you, but if you are doing it yourself, it is your responsibility to comply. For further information, and for regulations in Northern Ireland and Scotland, contact your local Building Control Office before starting work. If you are looking for someone to insulate your floor, Energy Saving Trust recommends you look for an installer who is a member of the National Insulation Association. We can also assist with contact information for local installers so please contact us with any enquiry you have.